In physics, the fundamental interactions, also known as fundamental forces, are the interactions that do not appear to be reducible to more basic interactions. There are four fundamental interactions known to exist: the gravitational and electromagnetic interactions, which produce significant long-range forces whose effects can be seen directly in everyday life, and the strong and weak interactions, which produce forces at minuscule, subatomic distances and govern nuclear interactions. Some scientists hypothesize that a fifth force might exist, but the hypotheses remain speculative. Each of the known fundamental interactions can be described mathematically as a field. The gravitational force is attributed to the curvature of spacetime, described by Einstein's general theory of relativity. The other three are discrete quantum fields, and their interactions are mediated by elementary particles described by the Standard Model of particle physics. Within the Standard Model, the strong interaction is carried by a particle called the gluon, and is responsible for quarks binding together to form hadrons, such as protons and neutrons. As a residual effect, it creates the nuclear force that binds the latter particles to form atomic nuclei. The weak interaction is carried by particles called W and Z bosons, and also acts on the nucleus of atoms, mediating radioactive decay. The electromagnetic force, carried by the photon, creates electric and magnetic fields, which are responsible for the attraction between orbital electrons and atomic nuclei which holds atoms together, as well as chemical bonding and electromagnetic waves, including visible light, and forms the basis for electrical technology. Although the electromagnetic force is far stronger than gravity, it tends to cancel itself out within large objects, so over large distances (on the scale of planets and galaxies), gravity tends to be the dominant force. All four fundamental forces are believed to be related, and to unite into a single force at high energies on a minuscule scale, the Planck scale, but particle accelerators cannot produce the enormous energies required to experimentally probe this. Efforts to devise a common theoretical framework that would explain the relation between the forces are perhaps the greatest goal of today's theoretical physicists. The weak and electromagnetic forces have already been unified with the electroweak theory of Sheldon Glashow, Abdus Salam, and Steven Weinberg for which they received the 1979 Nobel Prize in physics. Progress is currently being made in uniting the electroweak and strong fields within a Grand Unified Theory (GUT). A bigger challenge is to find a way to quantize the gravitational field, resulting in a theory of quantum gravity (QG) which would unite gravity in a common theoretical framework with the other three forces. Some theories, notably string theory, seek both QG and GUT within one framework, unifying all four fundamental interactions along with mass generation within a theory of everything (ToE). In 1873, James Clerk Maxwell unified electricity and magnetism as effects of an electromagnetic field whose third consequence was light, travelling at constant speed in a vacuum. The electromagnetic field theory contradicted predictions of Newton's theory of motion, unless physical states of the luminiferous aether—presumed to fill all space whether within matter or in a vacuum and to manifest the electromagnetic field—aligned all phenomena and thereby held valid the Newtonian principle relativity or invariance. The Standard Model of particle physics was developed throughout the latter half of the 20th century. In the Standard Model, the electromagnetic, strong, and weak interactions associate with elementary particles, whose behaviours are modelled in quantum mechanics (QM). For predictive success with QM's probabilistic outcomes, particle physics conventionally models QM events across a field set to special relativity, altogether relativistic quantum field theory (QFT). Force particles, called gauge bosons—force carriers or messenger particles of underlying fields—interact with matter particles, called fermions. Everyday matter is atoms, composed of three fermion types: up-quarks and down-quarks constituting, as well as electrons orbiting, the atom's nucleus. Atoms interact, form molecules, and manifest further properties through electromagnetic interactions among their electrons absorbing and emitting photons, the electromagnetic field's force carrier, which if unimpeded traverse potentially infinite distance. Electromagnetism's QFT is quantum electrodynamics (QED). In the conceptual model of fundamental interactions, matter consists of fermions, which carry properties called charges and spin ±​1⁄2 (intrinsic angular momentum ±​ħ⁄2, where ħ is the reduced Planck constant). They attract or repel each other by exchanging bosons. The exchange of bosons always carries energy and momentum between the fermions, thereby changing their speed and direction. The exchange may also transport a charge between the fermions, changing the charges of the fermions in the process (e.g., turn them from one type of fermion to another). Since bosons carry one unit of angular momentum, the fermion's spin direction will flip from +​1⁄2 to −​1⁄2 (or vice versa) during such an exchange (in units of the reduced Planck's constant). Gravitation is by far the weakest of the four interactions at the atomic scale, where electromagnetic interactions dominate. But the idea that the weakness of gravity can easily be demonstrated by suspending a pin using a simple magnet (such as a refrigerator magnet) is fundamentally flawed. The only reason the magnet is able to hold the pin against the gravitational pull of the entire Earth is due to its relative proximity. There is clearly a short distance of separation between magnet and pin where a breaking point is reached, and due to the large mass of Earth this distance is disappointingly small. The long range of gravitation makes it responsible for such large-scale phenomena as the structure of galaxies and black holes and it retards the expansion of the universe. Gravitation also explains astronomical phenomena on more modest scales, such as planetary orbits, as well as everyday experience: objects fall; heavy objects act as if they were glued to the ground, and animals can only jump so high. Gravitation was the first interaction to be described mathematically. In ancient times, Aristotle hypothesized that objects of different masses fall at different rates. During the Scientific Revolution, Galileo Galilei experimentally determined that this hypothesis was wrong under certain circumstances — neglecting the friction due to air resistance, and buoyancy forces if an atmosphere is present (e.g. the case of a dropped air-filled balloon vs a water-filled balloon) all objects accelerate toward the Earth at the same rate. Isaac Newton's law of Universal Gravitation (1687) was a good approximation of the behaviour of gravitation. Our present-day understanding of gravitation stems from Einstein's General Theory of Relativity of 1915, a more accurate (especially for cosmological masses and distances) description of gravitation in terms of the geometry of spacetime. Electromagnetism and weak interaction appear to be very different at everyday low energies. They can be modelled using two different theories. However, above unification energy, on the order of 100 GeV, they would merge into a single electroweak force. Electroweak theory is very important for modern cosmology, particularly on how the universe evolved. This is because shortly after the Big Bang, the temperature was approximately above 1015 K, the electromagnetic force and the weak force were merged into a combined electroweak force. Electromagnetism has infinite range like gravity, but is vastly stronger than it, and therefore describes a number of macroscopic phenomena of everyday experience such as friction, rainbows, lightning, and all human-made devices using electric current, such as television, lasers, and computers. Electromagnetism fundamentally determines all macroscopic, and many atomic levels, properties of the chemical elements, including all chemical bonding. This force is larger than the planet Earth would weigh if weighed on another Earth. The atomic nuclei in one jug also repel those in the other with the same force. However, these repulsive forces are canceled by the attraction of the electrons in jug A with the nuclei in jug B and the attraction of the nuclei in jug A with the electrons in jug B, resulting in no net force. Electromagnetic forces are tremendously stronger than gravity but cancel out so that for large bodies gravity dominates. Electrical and magnetic phenomena have been observed since ancient times, but it was only in the 19th century James Clerk Maxwell discovered that electricity and magnetism are two aspects of the same fundamental interaction. By 1864, Maxwell's equations had rigorously quantified this unified interaction. Maxwell's theory, restated using vector calculus, is the classical theory of electromagnetism, suitable for most technological purposes. The constant speed of light in a vacuum (customarily described with a lowercase letter "c") can be derived from Maxwell's equations, which are consistent with the theory of special relativity. Einstein's 1905 theory of special relativity, however, which flows from the observation that the speed of light is constant no matter how fast the observer is moving, showed that the theoretical result implied by Maxwell's equations has profound implications far beyond electromagnetism on the very nature of time and space. In another work that departed from classical electro-magnetism, Einstein also explained the photoelectric effect by utilizing Max Planck's discovery that light was transmitted in 'quanta' of specific energy content based on the frequency, which we now call photons. Starting around 1927, Paul Dirac combined quantum mechanics with the relativistic theory of electromagnetism. Further work in the 1940s, by Richard Feynman, Freeman Dyson, Julian Schwinger, and Sin-Itiro Tomonaga, completed this theory, which is now called quantum electrodynamics, the revised theory of electromagnetism. Quantum electrodynamics and quantum mechanics provide a theoretical basis for electromagnetic behavior such as quantum tunneling, in which a certain percentage of electrically charged particles move in ways that would be impossible under the classical electromagnetic theory, that is necessary for everyday electronic devices such as transistors to function. After the nucleus was discovered in 1908, it was clear that a new force, today known as the nuclear force, was needed to overcome the electrostatic repulsion, a manifestation of electromagnetism, of the positively charged protons. Otherwise, the nucleus could not exist. Moreover, the force had to be strong enough to squeeze the protons into a volume whose diameter is about 10−15 m, much smaller than that of the entire atom. From the short range of this force, Hideki Yukawa predicted that it was associated with a massive particle, whose mass is approximately 100 MeV. Assuming that quarks are confined, Mikhail Shifman, Arkady Vainshtein and Valentine Zakharov were able to compute the properties of many low-lying hadrons directly from QCD, with only a few extra parameters to describe the vacuum. In 1980, Kenneth G. Wilson published computer calculations based on the first principles of QCD, establishing, to a level of confidence tantamount to certainty, that QCD will confine quarks. Since then, QCD has been the established theory of the strong interactions. 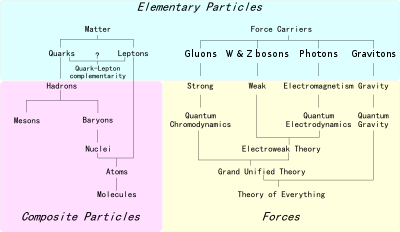 QCD is a theory of fractionally charged quarks interacting by means of 8 bosonic particles called gluons. The gluons interact with each other, not just with the quarks, and at long distances the lines of force collimate into strings. In this way, the mathematical theory of QCD not only explains how quarks interact over short distances but also the string-like behavior, discovered by Chew and Frautschi, which they manifest over longer distances. Some theories beyond the Standard Model include a hypothetical fifth force, and the search for such a force is an ongoing line of experimental research in physics. In supersymmetric theories, there are particles that acquire their masses only through supersymmetry breaking effects and these particles, known as moduli can mediate new forces. Another reason to look for new forces is the discovery that the expansion of the universe is accelerating (also known as dark energy), giving rise to a need to explain a nonzero cosmological constant, and possibly to other modifications of general relativity. Fifth forces have also been suggested to explain phenomena such as CP violations, dark matter, and dark flow. In December 2015, two observations in the ATLAS and CMS detectors at the Large Hadron Collider hinted at the existence of a new particle six times heavier than the Higgs boson. However, after obtaining more experimental data, the anomaly appeared to not be significant. People: Gerardus 't Hooft, Edward Witten, Howard Georgi. ^ Fackler, Orrin; Tran, J. Thanh Van (1988). 5th Force Neutrino Physics. Atlantica Séguier Frontières. ISBN 978-2863320549. ^ Weisstein, Eric W. (2007). "Fifth Force". World of Science. Wolfram Research. Retrieved September 14, 2017. ^ Franklin, Allan; Fischbach, Ephraim (2016). The Rise and Fall of the Fifth Force: Discovery, Pursuit, and Justification in Modern Physics, 2nd Ed. Springer. ISBN 978-3319284125. ^ "The Standard Model of Particle Physics | symmetry magazine". www.symmetrymagazine.org. Retrieved 2018-10-30. ^ Shivni, Rashmi (2016-05-16). "The Planck scale". symmetry magazine. Fermilab/SLAC. Retrieved 2018-10-30. ^ "The Nobel Prize in Physics 1979". NobelPrize.org. Retrieved 2018-10-30. ^ Newton's absolute space was a medium, but not one transmitting gravitation. ^ Krauss, Lawrence M. (2017-03-16). "A Brief History of the Grand Unified Theory of Physics". Nautilus. ^ Approximate. See Coupling constant for more exact strengths, depending on the particles and energies involved. ^ CERN (20 January 2012). "Extra dimensions, gravitons, and tiny black holes". ^ "The Nobel Prize in Physics 1979". The Nobel Foundation. Retrieved 2008-12-16. ^ "Is the Large Hadron Collider set to reveal secrets of the universe?". 2016-07-05. Retrieved 2016-07-12. ^ Elizabeth Gibney (August 5, 2016). "Hopes for revolutionary new LHC particle dashed". Nature. 536 (7615): 133–134. Bibcode:2016Natur.536..133G. doi:10.1038/nature.2016.20376. Retrieved August 18, 2016. Davies, Paul (1986), The Forces of Nature, Cambridge Univ. Press 2nd ed. Schumm, Bruce A. (2004), Deep Down Things, Johns Hopkins University Press While all interactions are discussed, discussion is especially thorough on the weak. Riazuddin (December 29, 2009). "Non-standard interactions" (PDF). NCP 5th Particle Physics Sypnoisis. 1 (1): 1–25. Retrieved March 19, 2011.